Costa Rica has nearly 300 different beaches along its stunning Pacific and Caribbean coastlines, each with a unique draw and distinct setting. Even on nearby beaches the sand can vary from white, black, or brown coloration. Some beaches are full of shells or scattered with rocks; others are soft with fluffy fine sand. Some are fantastic for swimming, and others are better for surfing. 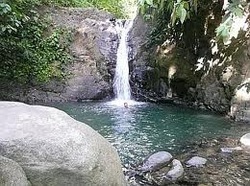 Listed below are some local beaches and waterfalls located in the Southern Zone. Be aware of the rip tides, there are strong currents and therefore swimming can be dangerous. If you find yourself in a rip current, Do not swim toward shore. You will be fighting the current, and you will lose. Swim parallel to shore, across the current. If you cannot swim out of the riptide, float on your back and allow the riptide to take you away from shore until you are beyond the pull of the current. Rip currents generally subside 50 to 100 yards from shore. Once the riptide subsides, swim parallel to shore and then back to shore. Riptides occur more frequently in strong winds. Streaks of muddy or sandy water and debris moving out to sea through the surf zone are signs that riptides are present. Also look for areas of reduced wave heights in the surf zone and depressions in the beach running perpendicular to shore. Remember - leave valuables at home, not in the vehicle, and lock the doors. Surfing beach, about 27 mi (44 km) south of Quepos is the quaint and growing beach town of Dominical. Rated 8.6/10 by visitors. Playa Dominical is considered by both Ticos and tourists to be the most consistent wave in Costa Rica. Wave heights rarely drop below waist-high with ideal sandbars producing quality lefts, rights, and plenty of good barrels. Playa Dominical is the focal point for surfing in the area and normally sees between ten and thirty surfers in the water in the high seasons (Dec-Mar and Jun-Aug). "Beautiful Beach" in English, truly lives up to its name. An incredibly scenic tropical beach, Hermosa is bordered by a spectacular forested cliff on the north, Marino Ballena National Park to the south, and backed by a palm-lined beach and rainforest covered mountains. Playa Hermosa’s waves are generally half the size of Dominical with crystal clear water and very good wave form. You can park your car directly next to the beach. Take a 25-minute walk from the center of Uvita to Punta Uvita Beach at ebb tide to discover the famous whale’s tail sandbar. an earthquake in the Pacific Rim created a tsunami current effect that removed the mid-section of the Whale Tail a couple of years ago, but mother nature has seen fit to redeposit the sands and allow access the the "fluke" of the tail once again. Enjoy walking through it to the point and dip in the warm, quiet waters at either side of this amazing formation. Not accessible from the Costanera, but from Playa Ballena on low tide: turn right on the main entrance of Playa Ballena until the end of the beach and climb the path of the wooded hill. Playa Arco is found on the other side. The beach is deserted, encircled by wooded, rocky cliffs. This lonesome beach is simply enchanting, even a small waterfall with fresh water shower as well as a cave accessible at low-tide is available! Playa Ballena is the main entrance of the Marino Ballena National Park. Very long beach of grey sand and small stones, bordered by several varieties of trees where one can find shade from the sun. Nice view of the reefs of Isla Ballena and Islas Tres Hermanas. located in Marino Ballena National Park, and is one of the best beginner’s waves in the area. Long, peeling waves break gentle on the outside, and then roll for a long way in towards the beach. This wave never gets very big - usually only around a third of the size of waves at Playa Dominical; and not just a beginners wave but a great longboarding spot as well. Marino Ballena is a stop for the humpback whales on their migratory route and during the winter months (Oct-Mar) it’s common to see mother whales, their babies, and adult males breeching the surface. 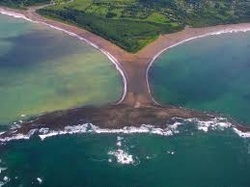 The Marino Ballena National Park (spanish ballena = whale) was the first marine park in Latin America. It was created in 1990 to protect the coral and rock reefs and the cetaceans such as Humpback whales, Bottle nose dolphins, spotted dolphins and other occasional visitors. Its dramatic coastline of pristine sandy beaches and rocky shores is the home of many tropical fish in its clear blue sea. 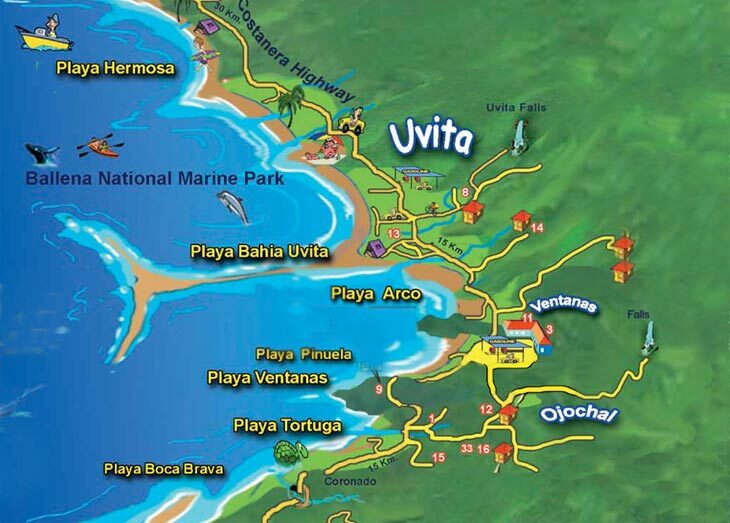 The park covers 13 kms of coastline from Punta Uvita to Punta Piñuela and consists of more than 5.300 marine hectares and 110 terrestrial hectares. Located about 15 km south of Uvita (before Km 174). Small, u-shaped beach with two caverns formed on the rock by the breaking waves. Great for swimming and playing with boogie boards. Ventanas (windows) gets its name from the beautiful sea caves that line the north and south ends of the beach. The two caves on the north end extend from the beach out to the ocean, a distance of about 50 meters, and during certain tides create a sort of "blowhole" effect. Pressure from each wave blows a large cloud of steam out onto the beach. The caves on the south end of the beach tunnel deeply into the rock. Located just ten kilometers from Dominical beach, on the road to San Isidro. The surrounding farms are owned by Don Lulo and his family. Go on the two and a half hour horseback riding tour leading to the magnificent 60 meter high cascading waterfalls of Nauyaca where you can swim and relax. Lunch and refreshments are included with this Dominical eco tour. It’s best to get here early on in the day to avoid crowds. Be prepared for the steep trek down and up the river bank to the waterfall swimming hole. Located close to the village of Escaleras in the quiet town of Dominicalito, Pozo Azul Waterfalls boast inviting crystal waters at the feet of a beautiful waterfall. Have fun swinging off the rope and into the refreshing waters, but use caution and be aware of the shallow waters and rocky edges that surround the swimming hole. Keep a look out for sloths, monkeys and other rainforest wildlife. 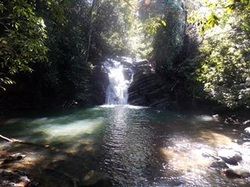 The waterfalls at Pozo Azul are located about 5 kilometers south of Playa Dominical. On the main highway head towards the Bella Vista Lodge and then take the first road on your right. Travel past a school and cross over a small stream. Continue on this road for about 300 meters until you reach a point where the road widens. There is parking at Pozo Azul Waterfalls is occasionally guarded, but it is best not to leave anything valuable in plain sight. Head east up the road next to Banco de Costa Rica. Make a left at the fork, go 400m on right. There is a restuarant La Catarata Uvita Restaurant. There is parking available by the entrance to the waterfall and also along the road. The trail to the waterfall is equipped with stairs and railings to assist you in reaching the falls. The waterfall area has a number of spots to relax in the water. The cost of entry is 500 colones or $1. This fee includes the usage of the bathrooms. There is a additional fee of 200 colones for use of the shower. The fee pays for the up keep and cleaning of the area, but please remember to take all garbage with you! Camping options are available. The restaurant also plays host to regular Full Moon Parties, featuring live music from local bands! Head south on the Costanera past Ojochal, turn left after the bridge when you see the sign for El Pavone Tilapia Restaurant. Drive 2 miles in, past the first tilapia restaurant. Eat at El Pavone Restaurant located up a hill on the right. You can drop a fishing line in the pond and catch your own tilapia if you like. If you time it right, you might see the oxen and cart bringing the wood for the cooking fire. The waterfall and swimming hole is on the left down a short trail.